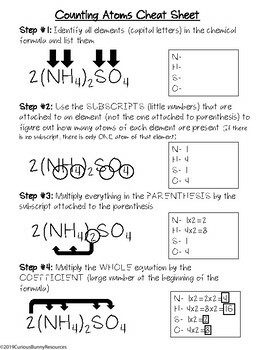 Counting Atoms can be a daunting task, but this cheat sheet will help save the day when your students are in a bind! It's always nice to have a reference sheet when you're learning something new, so here is one for counting atoms. It includes the 4 steps as well as each step being illustrated on the cheat sheet. This also comes with a beginner worksheet that has 5 problems of varying difficulties. 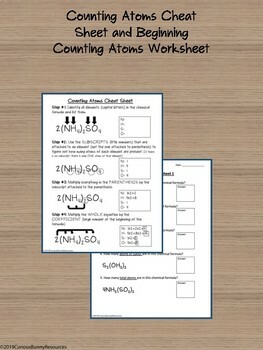 Stay tuned for the next counting atoms worksheet! This resource includes a limited use license. Please take into account the hard work that went into this resource and refrain from copying and distributing. 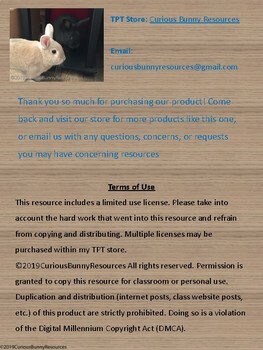 Multiple licenses may be purchased within my TPT store. ©2019CuriousBunnyResources All rights reserved. Permission is granted to copy this resource for classroom or personal use. Duplication and distribution (internet posts, class website posts, etc.) of this product are strictly prohibited. Doing so is a violation of the Digital Millennium Copyright Act (DMCA).